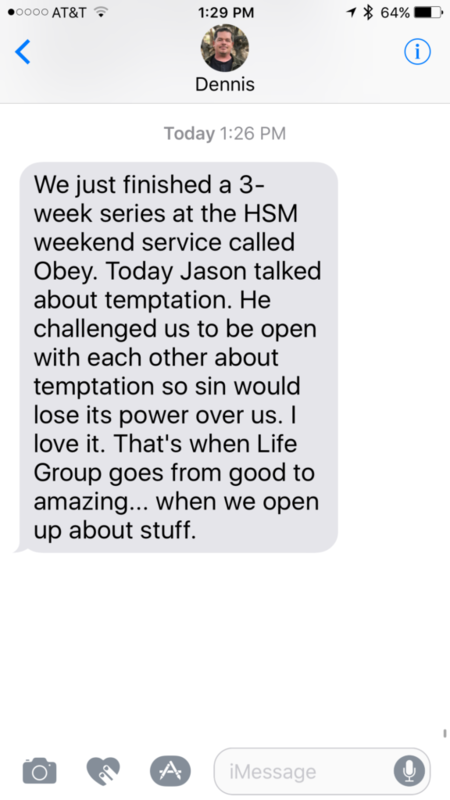 Half of my life group students do not attend the weekend service. I want them to realize good stuff happens there. I also want them to develop a desire to get there, aside from the challenges I make during Life Group for them to check it out. Today is the first time I sent out a message like this. My strategy going forward is to send a text out like this once a series. I don’t want the messages to go out every week or they’ll get ignored. Some weeks I’ll send out a message telling them what’s going to happen in the weekend service to entice them to show up. As youth ministry volunteers, we need to be continually honing our strategies to reach students effectively. If we wait for the paid staff to teach us everything or to tell us what to do, our ministry isn’t firing on all cylinders. To read more about how to be a continually more effective volunteer, download a copy of Volunteer Youth Ministry, A Roadmap for Effective Leadership. Dennis Beckner is a volunteer youth worker at Saddleback Church in Lake Forest, CA.